Today we were given a tour of parliament by Māori member of parliament Meka Whaitiri. 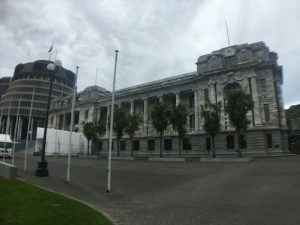 Our tour began by entering a whare-like room, with walls adorned by wood carvings and portraits of past, historically significant Māori parliament members. We were welcomed by a traditional pōwhiri, or protocol, exchanging a song between our class and Meka. Following the welcome ceremony, we toured the speaking chambers from both past and present, ending our visit in the Māori committee chamber. We sat around the table asking Meka a variety of questions, eventually ending our afternoon over tea. Overall, our last few days in Wellington have completely unhinged all of the preconceived beliefs I held about the state of existence for the Indigenous peoples of Aotearoa. I came into this study of Māori peoples with a skewed perception that in terms of Indigenous rights, Māori were so much better off than the natives from my home country. 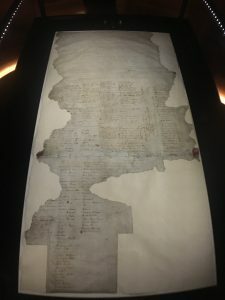 With both the Waitangi Tribunal, a governmental entity dedicated to looking into both contemporary and historical breeches of the Treaty of Waitangi on the part of the Crown, and the illusion of fast-pace progress in the settlement processes, it would seem that while there is still so much work to be done, Māori are far advanced in their pursuit for sovereignty in comparison to Native Americans. I tread carefully, because I don’t want to give off the impression that there has been no progression at all. Time and time again I’ve been left awe-struck by the resiliency of Aotearoa’s first peoples, and their unwavering commitment to their own autonomy. I’ve been so humbled in witnessing cultural performances, speeches delivered completely in Te Reo, and the historic strength of the people. Yet, in examining the detailed processes of how Māori must fight for sovereignty, it becomes so clear how easy it is to get caught up in a false idea that the New Zealand is edging towards a world “post” colonization. That they, unlike America, have successfully begun to amend the sins committed during colonialism. However, in understanding colonization as a process, rather than an event, it is evident that we will never truthfully live in a world rid of colonization. For this reason, it is imperative not to allow ourselves to get caught up in the idea that we’ve made strides immense enough to rectify the scars colonization has left on indigenous populations. As stated in Patricia Grace’s Potiki, “[As Indigenous peoples], we haven’t come a long way at all… we’ve been all left out of it in the end. We’ve helped build a country… Worked in the factories, helped build the roads, helped educate its kids… We’ve committed our crimes, done our good deeds, sat in Parliament, got educated, sung our hymns, scored our ties, fought in wars, splashed our money about…”, and yet despite all of this, Indigenous peoples must continue to struggle every day to receive the rights entitled to them for centuries (93-94). In this way, while the tour left me feeling both encouraged and frustrated, I think it revealed for me the heart of what it means to be indigenous in all parts of the world. To be indigenous is to be limited. It is being allowed an illusion of sovereignty at the cost of your autonomy not only as an individual, but as a tribe. However, it is also challenging this notion every day. It is not only seeing your limitations, but also the paths you’ll take to overcome them. Even more, in light of this, it is my hope that the Waitangi Tribunal never reaches an end. Not only because it is instrumental in dealing with contemporary breeches on the part of the crown, but also because there is no end point. Sovereignty is not a destination, but a journey. In operating under the false pretense that we’ve been ushered into an era post-colonization, we fall victim to seeing Indigenous peoples, such as the Māori, as monolithic, trapped by the notion that there is no growth left to be had. The fact of the matter is colonization will never cease to perverse our mindset, and in order for indigenous populations to continue their journeys towards sovereignty, they must be allowed the capacity and space to evolve. This entry was posted in Our Experiences and tagged #Māorirights, Aotearoa, sovereignty on September 8, 2017 by Danni.